Creating a Powerline network lets you extend your wireless connectivity to hard-to-reach places in your home without the use of lengthy cable wirings. For a video overview on how Powerline adapters work, click here. Here are some examples on the uses of Powerline networking. You want to browse recipes online while you are in the kitchen. However, the wireless network in the living room cannot reach where you are at. Instead of using additional Ethernet cables to extend your router to the kitchen, you can use Powerline adapters to establish wireless connectivity. NOTE: Instead of buying the adapters separately, you can purchase the PLWK400 Powerline adapter kit containing a PLE400 and a PLW400. Connect the PLE400 to the router using an Ethernet cable, then plug to an available wall socket. 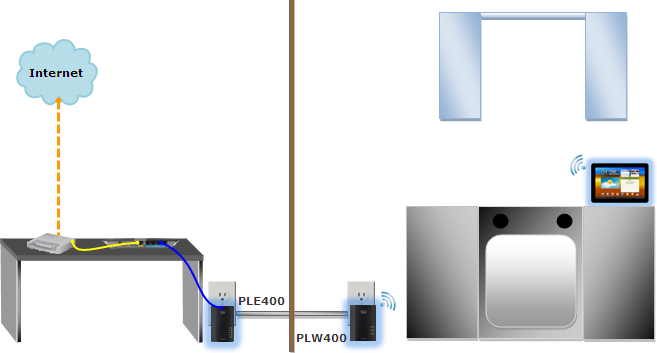 Connect the PLW400 (located in the kitchen) to an available wall socket. NOTE: The wall sockets where the Powerline adapters would be plugged in should belong to one (1) circuit breaker. Plugging the Powerline adapters to the same circuit breaker will ensure communication between the two adapters. Refer to your building’s electrical layout to know if your power outlets belong to the same circuit breaker. 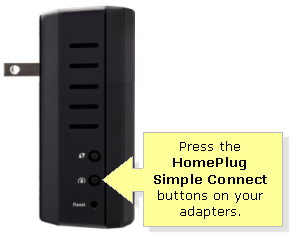 Press the HomePlug Simple Connect buttons on both devices. 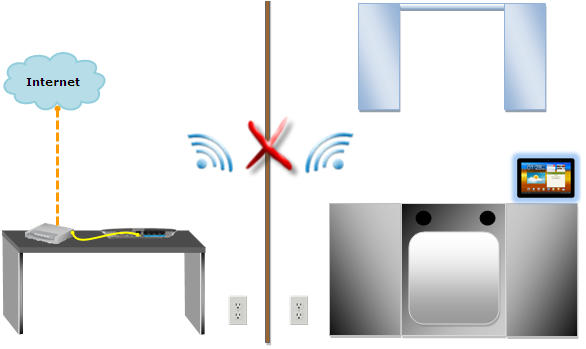 In this example, the wireless network is extended to reach the kitchen without using any wires but through electrical lines (or power lines) to establish the connection. Your wireless connection is established on the third floor. You would like to stream videos from your bedroom located at the third floor down to your study room and entertainment room at the first and second floors, respectively. You can use Powerline adapters to extend the reach of your wireless network to different areas in your home, and make it possible to share media content. Three (3) Powerline adapters will be plugged in each floor so the wireless network can reach all specific points in the house. Make sure that all the adapters are in the same circuit breaker for them to communicate. On the third floor of the house, connect the PLE400 to the router and plug it to an available wall socket. On the second floor of the house, plug the PLW400 to an available wall socket. 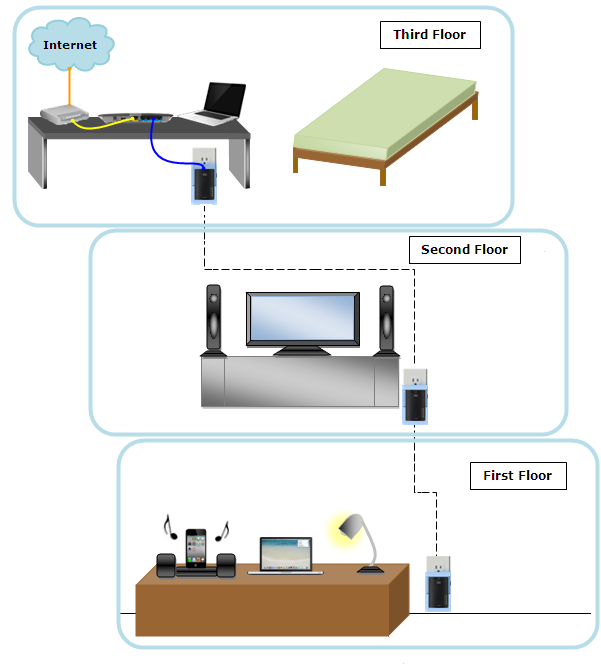 NOTE: A PLW400 may not necessarily be required to be plugged in this floor since the wireless signal of the router may still reach this area. However, adding the adapter can ensure a more robust signal. On the first floor, plug in the other PLW400 on an available wall socket. 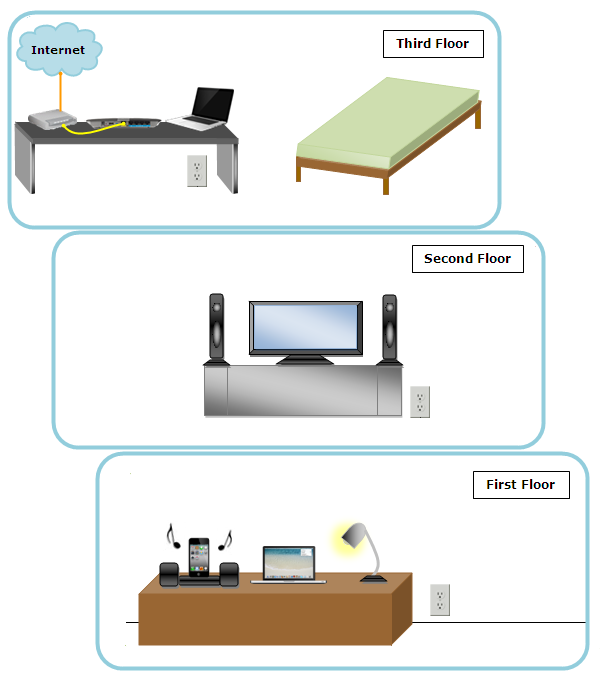 NOTE: For setup ease, you may temporarily relocate the adapters closely and move them to their desired locations after pressing the HomePlug Simple Connect buttons. Should you encounter any difficulties while setting up your Powerline network, you may click on the link below for further assistance. To understand the basic concepts of Powerline networking, click on the link below.